(Nanowerk News) Electrical and computer engineers at North Carolina State University have developed a new technique for creating less-expensive, low-power embedded systems - the computing devices found in everything from thermostats to automobiles. "Using our techniques, we've been able to create prototype systems with power converters that have a combination of energy efficiency and low cost that - as far as we've been able to tell - is unmatched by anything currently on the market," says Alex Dean, co-author of a paper on the work and an associate professor of electrical and computer engineering at NC State. An embedded system with common peripherals. To understand the new technique, you have to know a little about embedded systems. For one thing, they require a power source. And to maximize energy efficiency, the system should be designed to operate using the best voltage possible. Sometimes this means using the lowest voltage needed to run the circuit. At other times, this means raising the voltage slightly so the system can finish the work sooner, and then going into a low-power sleep mode. But batteries usually put out power at a voltage level that makes the system operate inefficiently; often, the battery puts out more voltage than the system needs. 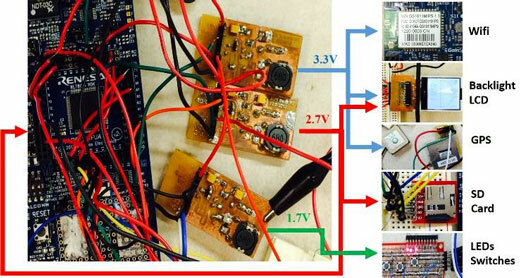 To change the voltage to the best level, a system may use a power converter. The most efficient power converters, called switch-mode power converters, have two parts. One part consists of "power stage" hardware that controls the storage and flow of power. The other part is a "controller" which allows the converter to respond to changes in the embedded system's demand for power or changes in the flow of energy from the power source, or even provide protection against extreme temperatures and device failures. The controller can be a specifically-designed circuit or a separate processor which runs special control software. Having a dynamic, responsive power converter is also important because it allows the embedded system to be more energy efficient; the system can go to sleep, then operate quickly, then shut back down - and the power converter can adjust the flow of power accordingly. "Our advance is that we've used design principles from real-time systems and incorporated the power converter software into the embedded system processor. These methods guarantee that the other software on the embedded system's processor will not disturb the power converter's correct operation," Dean explains. "This eliminates the need for a separate processor or controller circuit on the power converter itself, which in turn makes the overall system less expensive." It also makes the embedded system smaller, lighter and more flexible. "Because the embedded system software and power converter software are using a shared processor on a single chip, it gives developers more coordinated control over both the system's functions and related demands those functions may make on the power converter," Dean says. The researchers made two prototype converters using the new technique and compared them to dozens of other compatible power converters on the market - and found that none of the other converters could match the prototypes' combination of low cost and high efficiency. "Our second-best prototype had 90 percent efficiency - less than 10 percent of the energy was wasted," Dean says. "Our best prototype had 95 percent efficiency. And both had component costs of about 50 cents. All other converters either cost more, were less efficient or both." The paper, "Using Real-Time System Design Methods to Integrate SMPS Control Software with Application Software" (pdf), will be presented at the IEEE Energy Conversion Congress & Expo being held Sept. 20-24 in Montreal, Canada.